Our patented textured (ribbed / ridged) design mobilizes soft tissue to enables deeper access to muscles so you can more precisely target sore and knotted tissue. 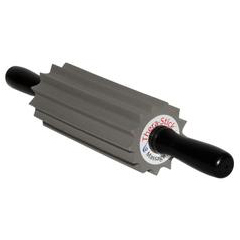 Compared to traditional smooth rollers, our original patent pending (ridged/ribbed) design prevents excess sliding so you have more control of the roller position to achieve effective tissue release. 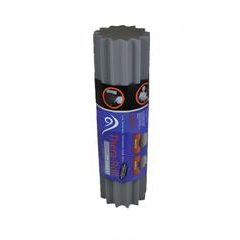 Made in the USA from very high quality, long lasting, and easy to clean foam. 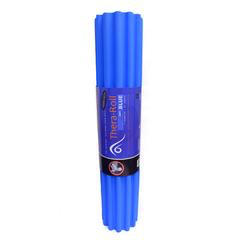 Gentle release of tender muscles designed for beginners or those recovering from injury. Recommended for those under age 15. 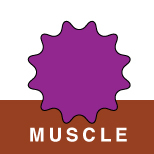 Deep release of sore and fatigued muscles designed for competitive athletes. 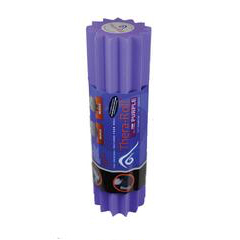 For more information on proper foam rolling techniques using the Thera-Roll, download our convenient 2-page guide by clicking the image below. Lie in the plank position and place the Thera-Roll® under the quadriceps. Roll over the Thera-Roll®, concentrating on the area from the top of your knee caps up to the front of your hips. You may also focus on the inner and outer aspects of the front thighs. NOTE: Don’t roll over your knee caps, as doing so will cause irritation. 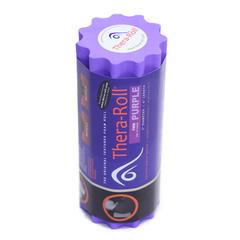 Place the Thera-Roll® under the upper thigh and lie on your side. 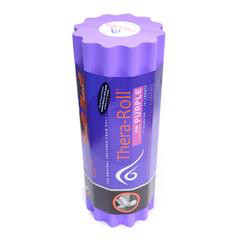 Roll the Thera-Roll® over the tissue on the outer thigh between the hip and side of the knee. NOTE: Don’t roll over the outer bony point of the hip or the bony aspects of the knee, as doing so will cause irritation. 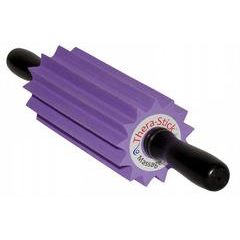 Lie in the plank position on the floor and place your inner thigh over the Thera-Roll®. Roll over knotted or tight muscle tissue between the inner knee and just below the groin. NOTE: Avoid rolling over your knee cap or any other bony prominence of your knee. 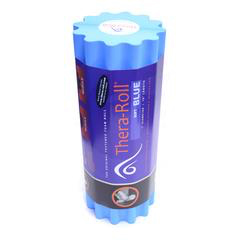 To release tightness and knotted areas in your hips, sit on the Thera-Roll®, move side to side, and roll up and down. Focus on one hip at a time for a more intense muscle release. If needed, place a pillow or a foam pad under your hands. NOTE: Don’t roll over your Sacroiliac joints, located in the back of your hips, as doing so will cause irritation. Place the Thera-Roll® horizontally against a wall or against a high-backed seat and lean into it so that the muscle just to the side of your spine is impacted. Work the tissue with small up and down and side to side rotary movements. NOTE: Do not rotate onto the Thera-Roll® beyond the area just below your ear lobe. Place the Thera-Roll® horizontally against a wall or against a high-backed seat and lean into it so that the tissue just below your skull is impacted. 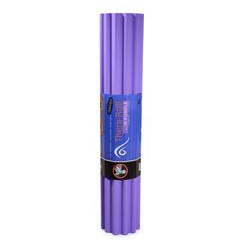 Slowly and gently work into the tissue with small up and down movements. Rotate your head and neck to release tissue around the sides of your upper neck. Place the Thera-Roll® at an angle slightly greater than horizontal against a wall or against a high-backed seat so that the muscle just to the side of your spine is impacted. Work the tissue at the base of your neck. 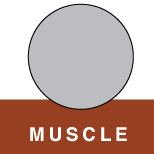 Focus on the muscles between the neck and shoulder. NOTE: Do not rotate onto the Thera-Roll® past the area just below your ear lobe. 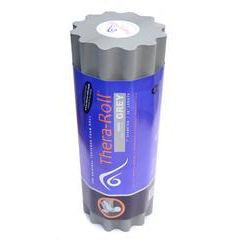 Place the Thera-Roll® horizontally against the wall. 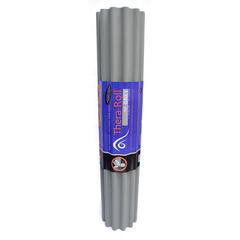 Lean into the Thera-Roll® with the shoulder to massage the upper arm. You may also choose to focus on the area between the shoulder blades. NOTE: Do not roll over bony prominences of the shoulder region, as this may cause increased pain.